That was one of the most exciting days of my life. It was The Lighthouse Keeper’s Lunch and ‘they’ were the original publishers, Andre Deutsch. The book came out in 1977 and has been in print ever since. Plus there were more books… seven more about the lighthouse keeper and other titles too. The idea for the story came during a visit to look at the Beachy Head lighthouse near Eastbourne. There is a wire that goes from the cliff down to the lighthouse on the rocks. One of the children asked what it was for. 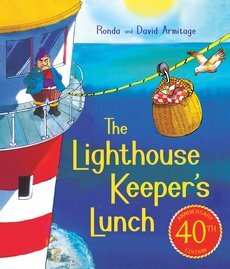 David replied, ‘oh I expect it’s for the lighthouse keeper’s lunch.’ I knew by then that I wanted to write so I was always listening and looking for story ideas. As an older child I lived on a farm beside the sea in New Zealand, where I was born, so the sea and even a lighthouse were familiar to me. I loved the idea and I liked that I could write about the sea. I have always been a reader. 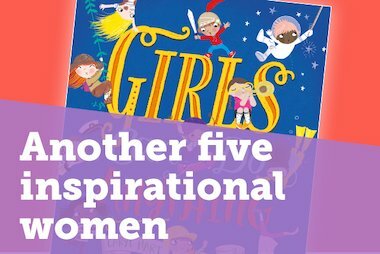 As a young child I went to a very small primary school in the backblocks but when I got home there was no one to play with, the nearest neighbours were several miles away so if I wasn’t helping with the animals I would read. Because the nearest library was miles away my mother was always asking people to search their book shelves for books for me to read. It is almost impossible to really know why a book, or books, are popular. 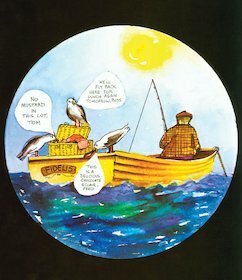 Certainly children like the greedy seagulls. They enjoy their bad behaviour! There are no children in the books and the Grinlings are old enough to be grandparents. Hamish the cat is popular as cats often are and of course there is the lasting drama of the sea, sometimes beautiful and often dangerous. And light houses, beacons of hope on dark nights. It is also a book that has some problem that has to be solved. Who knows? I have loved drawing ever since I can remember. As a small boy I spent much of my time on my stomach on the bedroom floor, drawing. It always seemed quite magical to me. And stories? I was very frightened by Hansel and Gretel. I particularly recall the wicked witch who asks Hansel to put his finger through the wire so she can feel how fat he is getting, to see if he is ready to be eaten. I thought that was terrifying. Ronda writes most of the story before I do any illustrations. Once we have a general idea then I begin doing lots of pencil sketches so we can have a pictorial idea of what the story might look like. I don’t do the final illustrations until Ronda is sure that the story is how she wants it to be. But we do help each other. Sometimes I have ideas for the story and she often has ideas for the illustrations. Although I have illustrated many of Ronda’s stories, nowadays I spend more time painting than illustrating and Ronda has other illustrators for her most recent books. 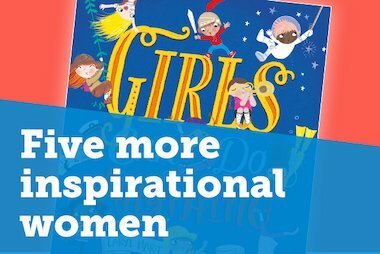 Follow @scholasticuk for the latest news!